Rachel Maddow speaks with Bernie Sanders during MSNBC's “First in the South Democratic Candidates Forum” Friday in Rock Hill, S.C.
An energized and confident Bernie Sanders argued Friday night that his economic message would resonate south of the Mason-Dixon Line, "because the issues that impact the people of South Carolina, the South and all over America are the same issues that impact the people of Vermont — and that is that the middle class of our country is disappearing." 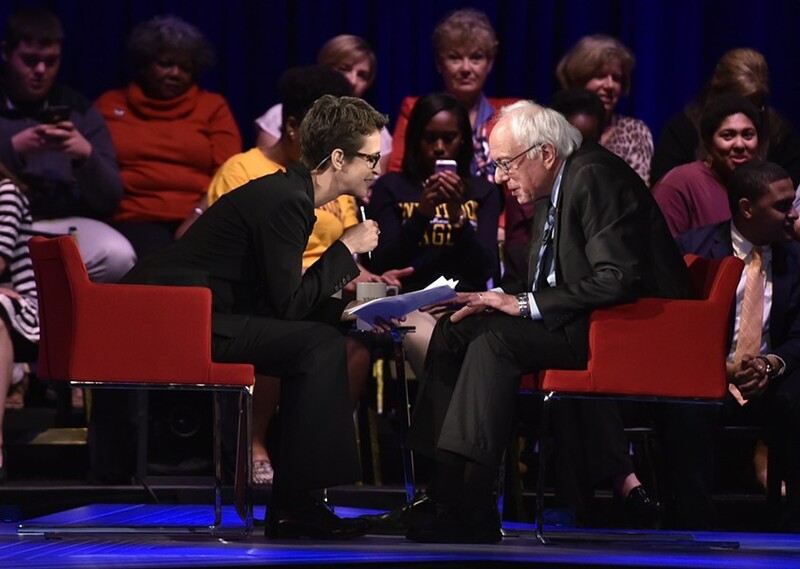 Sanders made his case during a friendly, 27-minute exchange with MSNBC's Rachel Maddow onstage at Winthrop University's Byrnes Auditorium in Rock Hill, S.C. 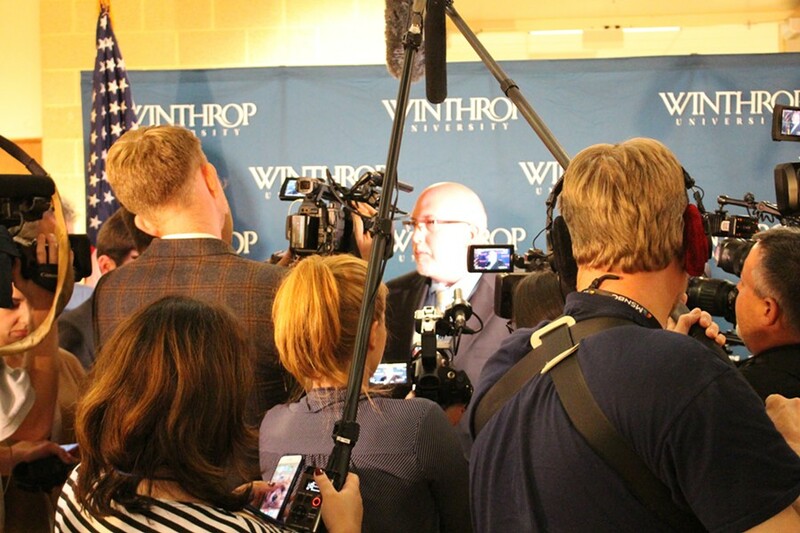 Billed as the "First in the South Democratic Forum," the event bore little resemblance to the food fights that have characterized the three Republican presidential debates. 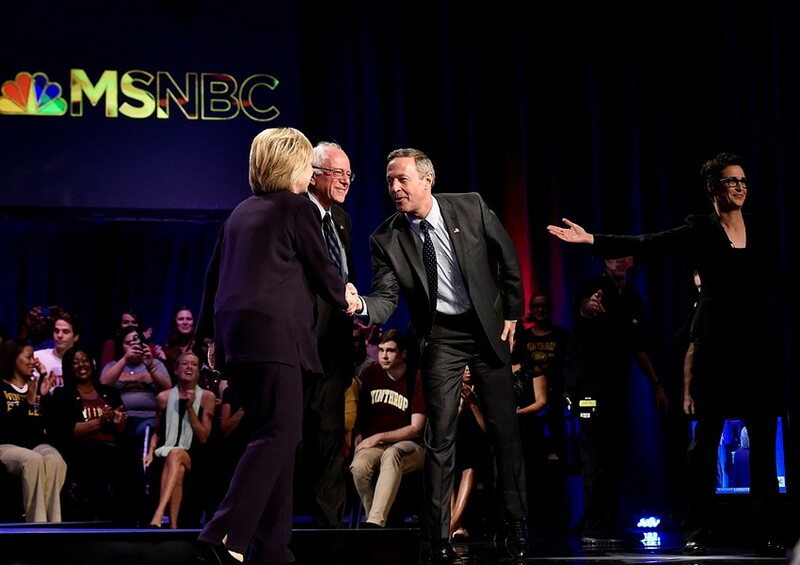 Rather, Maddow interviewed the three Democratic candidates — former Maryland governor Martin O'Malley, Sanders and former secretary of state Hillary Clinton — sequentially, posing cerebral, policy-focused questions. Sanders, who has struggled to gain traction in South Carolina, had a lot to prove. Maddow noted that just 8 percent of the state's African American voters supported his candidacy, according to the latest Winthrop Poll, leading her to question whether a senator who represented an overwhelmingly white state could "carry the flag" for black South Carolinians. "I believe I can," Sanders said. "If you check out my record, you'll find that there are very few members of the Congress who have a stronger record on civil rights than Bernie Sanders has." But the Vermont independent said he wasn't just focused on southern blacks. "I'm going to go out and talk to white working class Americans and say, 'Why do you keep voting against your own best interest?'" he said. "Why are you voting for people who are going to deny you health care? They're going to send your jobs to China. They're not going to raise the minimum wage." Sanders continued to critique Clinton's record and took several shots at the national news media, but he reserved his toughest remarks for Republicans, who he accused of pushing voter-suppression laws in South Carolina and elsewhere because "they're afraid of a fair election." "What Republicans are doing is so un-American, it is so outrageous that it is literally beyond belief," he said. "They are political cowards, and if they can't face a free election, they should get another job." Friday’s forum failed to attract the attention lavished upon conventional debates this season, but it still featured many of the trappings. Dignitaries such as Rev. Jesse Jackson, Sr., Congressman Jim Clyburn (D-S.C.) and Democratic National Committee chair Debbie Wasserman Schultz alighted upon a spin room after the event to opine on the night’s proceedings. 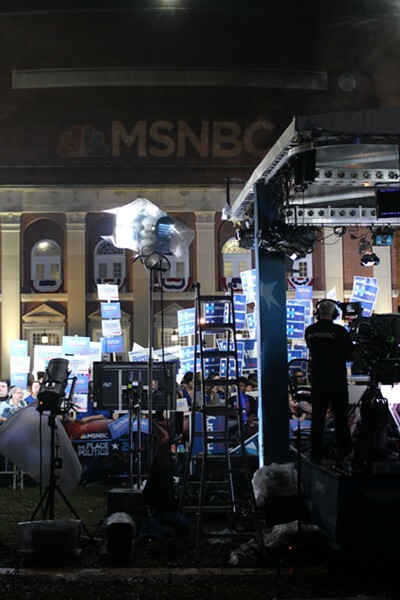 And dozens of enthusiastic supporters of the various candidates mobbed a set outside Byrnes Auditorium, from which MSNBC’s Chris Matthews broadcast “Hardball” before the forum began. 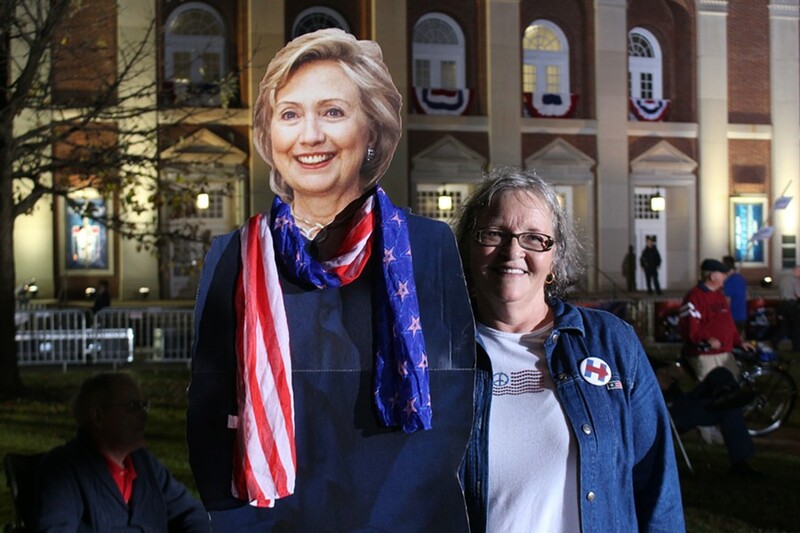 As Matthews interviewed Sanders campaign manager Jeff Weaver and surrogates for the Clinton and O’Malley campaigns, West Virginia resident Ellen Friend stood nearby with a life-size cardboard cutout of Clinton. James Arel, a bearded lapidary from nearby Fort Mill, came equipped with a black Sanders T-shirt he’d recently purchased online. “I’m a socialist,” he explained when asked why he supported Sanders. The MSNBC event came just hours after President Barack Obama announced his rejection of the proposed Keystone XL pipeline, providing an opportunity for Sanders to highlight his long-running opposition to the project. But when Maddow quoted a recent remark Sanders made to the Boston Globe’s editorial board that he “disagree[s] with Hillary Clinton on virtually everything,” the candidate tried to turn the tables. Sanders’ recent attempts to soften his image were on full display Friday evening, from the moment he took the stage and gave Maddow an enthusiastic bear hug. He twice invoked his love for his children and grandchildren, a topic he once avoided. The senator hammed it up when Maddow prepared to ask a series of mystery questions she’d chosen at random for each of the candidates. When Maddow asked what his dream job would be if he weren’t in politics, Sanders said he’d like to run CNN. “And if I was president of CNN, trust me, the way media deals with politics would radically change,” he said. Asked what he missed most “that technology has made obsolete,” Sanders answered, simply, “books.” And, he added, “I miss the fact that when I'm in a car or at home, there are not all kinds of buzzes and noises going off making me a nervous wreck. I miss peace and quiet, which I very much enjoy." Hillary Clinton, Bernie Sanders, Martin O'Malley and Rachel Maddow during MSNBC's “First in the South Democratic Candidates Forum” Friday in Rock Hill, S.C.
Sanders is scheduled to hold a press conference Saturday afternoon in Columbia, S.C., during which he’ll appear with high-profile South Carolinian supporters. He plans to hold a town hall meeting in Aiken, S.C., Saturday night and then travel to Las Vegas on Sunday. Seven Days will bring you more on Sanders’ South Carolina tour online and in Wednesday’s paper.